Discussion in 'Airheads' started by ubersoeren, Feb 9, 2019. Im trying to remove my late style clutch assmebly and flywheel as I have a suspicion of a leaking mainseal or oilpump gasket. I marked all parts to get the ballance right when I reassemble it all again, removed all six bolts a bit at a time in a criss cross pattern. But the clutch assmebly wont budge, I taped it gently with a hammer and applyed some heat but it is dosent move. Any tricks that I should know about, to get it off without just brute force? was this in a running bike with a functioning clutch? The outer plate has locating pins by the bolts (if this is a later airhead). The pins sometime stick..
No its a running bike, my daily driver, a 1983 R65. The clutch was slipping bad, I tried adjusting it but with no avail. I took the gearbox of and found the clutchhousing and parts of the clutsh assembly was covered in oily grime. On top of that there is the fact that I have no idea if this is the original clutch, so there is a good chance that its worn out as well. Usually the pressure plate spring pushes assembly out as you loosen bolts. (‘hence need for longer bolts in 3 holes (or more) to release pressure. If you’re replacing friction disc I’d spray some rust dissolving penetrant around edges and let it sit over night, then try some heat. If you’re pulling flywheel make sure to block crank from moving forward before starting. PaulBarton and SmittyBlackstone like this. The later clutches (such as this one) do not require the three longer bolts. 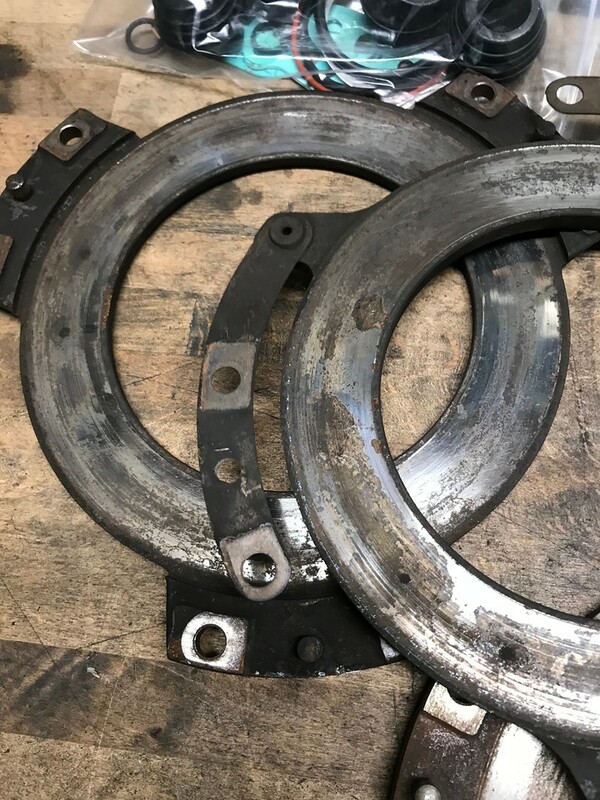 Southland clutch is worth considering.. they can machines the friction faces and apply new friction material to the disc and get you going again for less than OEM parts, although you should measure the spring as it must likely does need replacement. dmftoy1 and SmittyBlackstone like this. Dosent the three bolt spring pressure release methode only apply to pre 1980/81 clutches? You can see the pins on the picture of the clutch out of my 84 RS (that I replaced). Look at 10, 2 and 6 o'clock. SmittyBlackstone and ubersoeren like this. I would put three bolts back, just finger tight, then back them off a turn. Then get with the penetrantes and heat and whatnot. Nice to have backup if something goes SPRONG or wants to get cocked. +1 on using Southland Clutch. If going with new parts you have to buy 2 pressure plates and the clutch and spring. SC machines the 2 plates (needed because they are no longer flat) and rebuilds the disc with thicker material. You still should buy a new spring. This saves about 50% over price of new parts. If the disc is thick enough and the system really doesn't need a rebuild kit can all be cleaned with brake cleaner and reused. I frequently use one of these near the locking pins to get them apart. They get reassembled with anti-seize or moly paste. This might be a dumb question, but if the seized pins are the problem, shouldent I be able to take the whole assebly off the flywheel while the clutch assembly is stuck together? maybe they go through into the flywheel. It would be the way to do it to keep the whole stack in registration....and that is what pins are used for. Take it apart and see. Just force the assembly apart with a pry bar, screwdriver or the like. Technically the clutch components ride on the clutch carrier, which functions as a flywheel. that's where the pins are stuck, in the clutch carrier. Got it apart and cleaned, the friction disk was 4mm, so that needs replacing. I can't see the photos. Some weird sort of photo sharing you got going on there. Maybe others can see, maybe not. My computer set up these days is weird and I don't get everything anyway. The 2 pieces that the disk is held between wear in a cone shape. If you want to judge them you have to measure the taper of the surface. But I can't tell you what sort of figures are acceptable because the bottom line is to replace them because with the disk worn out they are not expected to survive. I think we earlier suggested Southland Clutch. This may take a little more time but it is highly recommended. There have been threads here but you'll have to search that as I have lost the ability to link with my current computer set up. BTW you can load photos directly to advrider. One of the perks we get because of ads these days. Too much 'lip'. Ether have it machined or get new. Your in Denmark .. so sending over to the USA to have it machined is ridiculous and will cost more than the machining. You should be able to find a local clutch machining shop that can do it for you. Agree. The surfaces are bad and need to be made flat again. How many miles? Shipping is one, dealing with custom is another, and one needs to pay duty on the repair. A pain in the back really not worth it. Very hard to find this type of shops in Europe! There are lots of shops building "race" clutch disks, but never found one that routinely rebuilds BMW clutches/pressure plates.